Let’s be honest here: as many have said time and time again, there is no tablet market, only an iPad one. For reasons unbeknownst to myself, I (still) don’t own an iPad. It’s not that I don’t want one, it’s that an iPad is a pretty sizeable outlay1 for a product that has an unknown usage ratio. 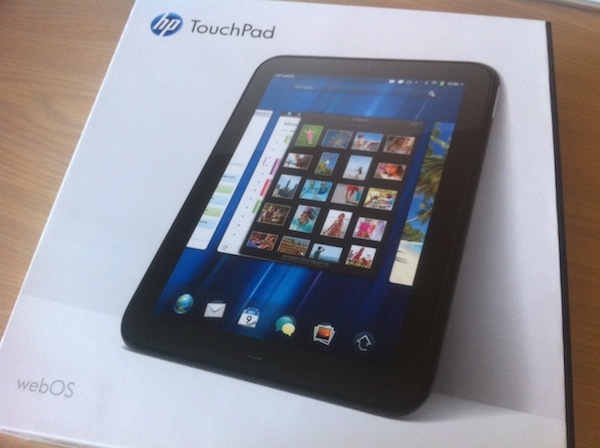 Irrespective of the reason I don’t (yet) own an iPad, I do own just one tablet; the HP TouchPad. After what can only be described as a particularly enthralling acquisition saga, it was time to delve into the TouchPad itself, and — perhaps more importantly — its operating system, webOS. The TouchPad is a pretty basic tablet, really. No fancy bells or whistles here. It looks almost exactly like the original iPad does, only with a few more curves at the edges instead of the bevelled edge of the iPad 1, and with a few side ornaments re-arranged. If you’re holding it in the correct portrait orientation (home button on the bottom of the face of the device), the speakers are on the left hand side. Yeah, speakers, as in plural: the TouchPad features two speakers with Beats(TM) audio. I’m not entirely sure whether the Beats(TM) audio is a hardware thing or a software one — perhaps even a combination of both — although my suspicion leans towards the latter, due to the presence of a toggle in Sound preferences to turn Beats(TM) audio on or off. In any case, the resultant audio emanating from those tiny but stereo speakers is pleasant enough, even above-average. Like all small speakers, they lack only in any real bass; more than capable of getting the job done, certainly, but no aural pleasure device. I wouldn’t go so far as I call the sound quality of the TouchPad “tinny”, but it’s definitely nothing to write home about. The rest of the TouchPad is pretty standard: there’s a sleep/wake switch on the top right just like the iPad, and a 3.5mm headphone jack on the top left, also just like the iPad. On the right side (when held in the correct portrait position as before), there’s even a volume rocker, just like the iPad. Notably absent from the TouchPad is a physical silent switch. What’s interesting is that the side with the volume rocker has an equal-spaced slot on the bottom part of the device. Pushing the slot in pops out some little sliding tray — presumably this is the SIM card tray for the mythical 4G version of the TouchPad that never saw the light of day (officially, anyway). Moving on to the front of the device: up the top you’ve got a truly mediocre front-facing camera (that, somewhat surprisingly, ranks in at 1.3 on the megapixel scale), something Apple didn’t think about putting in the iPad until the second version. A peanut-sized “home” button (which actually glows when you’ve got new notifications on the device, acting as a notification LED — something no iOS device has) and a 9.7-inch, 1024×768 resolution LED-backlit IPS display (pretty much identical to the display on the first iPad) round out the front of the most discontinued tablet with the shortest availability period by the company with more misdirection than not you’ve never seen. By now you’ve probably realised this is mostly going to be about the hardware of the TouchPad, rather than a review of webOS (either as the operating system that powers the TouchPad or as a tablet/smartphone platform). The TouchPad does have one really cool thing going for it: inductive charging. A small device called the Touchstone enables wireless charging via the power of induction, and what’s more, the Touchstone charger also doubles as a stand, to save you the embarrassment (others might say sheer ingenuity) of using one of those two-dollar plate stands as a stand for your equally-as-cheap TouchPad. Pre smartphones have this ability to charge via their own Touchstone devices as well, and as gimmicky as it sounds, the TouchPad Touchstone is actually pretty cool tech. My only wish is there was some way it could sync as well; perhaps a combination of a syncing/charging stand. Under the hood, there’s a dual-core 1.2GHz Snapdragon processor, 1GB of RAM, Bluetooth 2.1, accelerometer, gyroscope, ambient light sensor, and basically everything else you expect from a tablet device. Even a vibrate motor! The Bluetooth works just fine, although webOS does have a few tricks up its sleeve when it comes to pairing with phones (which you’ll have to wait until part three to read about). It works just as you would expect when paired with a Bluetooth keyboard (although I did have a few issues pairing it at first, see this post for how it works), and even though there’s a dedicated keyboard for the TouchPad available as an accessory from HP, I tested it with my official Apple wireless keyboard and it worked just fine. That’s just about all I want to say about the HP TouchPad hardware. Overall: just about average, even on par, with other devices available. The software side is where it gets a little more interesting, so watch this space for that piece! If there’s anything I’ve missed, I’ll add it as some sort of addendum to the next piece, HP TouchPad: Part Three: webOS. Look for that in a few weeks.